Hotpoint are quite a force when it comes to washing machines. They have a lot of appliances on the market and there is a lot more to these machines than simple wash and rinse. If you take the time to compare models, you will find all manner of bells and whistles such as faster spin cycles, built in pre-treat features, programmable settings, quiet operation, among other features. How Much Should You Pay For a Washing Machine? If you are looking for an affordable washing machine, Hotpoint is one of the best brands to consider. This brand actually refers to its appliances as being ‘created to affordably meet the needs of busy lives’. So, you will not only pay less than with most options in the market, but you also get a washing machine that will keep up with your needs and do an effective job at cleaning your clothes to boot. But, do not just take our word for it. Check out the features of the Hotpoint Aquarius WMAQF 721p in this buyers guide. In addition to falling into the list of Hotpoint’s cheapest options, this washing machine is arguably one of the best value washers in the market. The first plus of the Hotpoint Aquarius is that it is a freestanding model, which means you can install it anywhere in the house, whether thats in you kitchen, garage, or utility room. All you need is space and easy access to the minimum required for any washing machine: electric power, continuous flow of water, and a drain. Once you have set up the machine, using it is equally as easy. You simply power it up using the available ON/OFF button, load your clothes via the front door, select your preferred settings, and then press the START/PAUSE button to run a cycle. Provided controls include a wash cycle selector knob, spin option, as well as temperature and cleaning action buttons. Also featured on the machine are a detergent dispenser drawer, child lock button, a display that shows selected setting, wash duration, & a key image symbolizing the washer’s door is locked, and a Delay Timer button that allows you to pre-program the washer to start running at a later time. With washing machine drum sizes usually ranging from 5 to 12 kg, this washer’s 7kg size, unfortunately, falls on the lower end. That said a 7-kilo drum size is not something to dismiss quickly. The drum can take up 35 shirts, a double duvet, or even a combination of 4 shirts, 2 pairs of men’s jeans, 4 pairs of children’s jeans, 2 regular bath towels along with 3 smaller towels, 3 tea towels, and 2 pillowcases, without breaking a sweat. 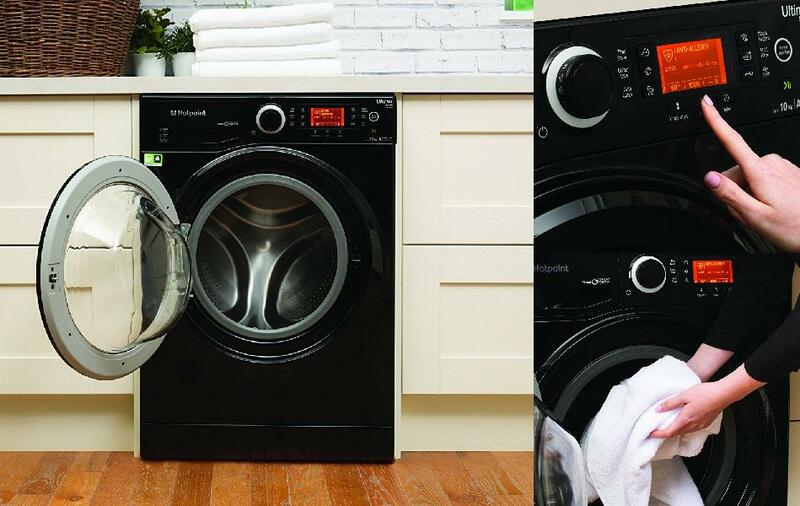 Therefore, if you have a small or medium-sized family, the Hotpoint Aquarius can easily meet your washing needs. This washing machine offers a maximum rotation speed of 1200 rpm. The spin speed is adequate and will draw a good amount of water from your washing without eating up too much electricity. Moreover, you can adjust spinning action to suit different loads of laundry. 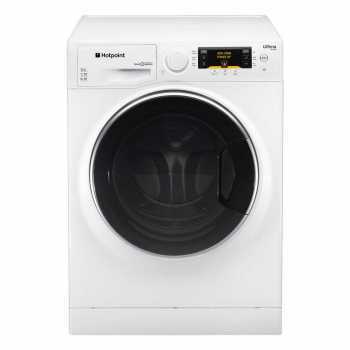 The Hotpoint Aquarius WMAQF 721p offers enough wash cycles that take on any laundry load in a typical home. An Anti-Stain Cycle combines instant detergent activation, precise temperature control, and a digitally controlled variable motion to ensure perfect results every time even in the face of heavily soiled clothes. Delicate garments, in turn, get their very own certified Woolmark Platinum Care Cycle, which applies just the right amount of pressure to ensure a perfect clean without stripping away the original softness of included clothes. You also get an Allergy UK endorsed Anti-Allergy Cycle for good measure. This cycle removes all major allergens (including pet hairs, pollen, and dust mites) to give you clean, fresh clothes that are also comfortable on the skin. Are There any Additional Noteworthy Features? In addition to being affordable, the Hotpoint Aquarius is also energy efficient. It has an A+ energy rating and consumes on average just 212-kilowatt hours of energy per year and 10,600 litres of water annually. The Aquarius WMAQF 721P washer has some smart functions as well. If you select settings that are not compatible with the chosen wash cycle, the washing machine will not start and an indicator light will begin to flash, alerting you to the situation. What’s more, pressing the START/PAUSE button after the washer is already running will halt a cycle, allowing you to adjust settings or add more clothes. You may also opt to put the washer in standby mode for 30 minutes by pressing the ON/OFF button. Clearly, Hotpoint is not all hype but rather a serious manufacturer when it comes to washing machines. At less than around £250 (at the time of writing) their Aquarius WMAQF 721p washing machine is very impressive. It takes on a substantial load, delivers the ultimate clean, adjusts to your needs, and makes your clothes healthier to wear, all the while saving on energy consumption. One look at the Hotpoint Ultima S-Line RPD9467JKK and you will be hooked. A more than welcome variation to the monotonous white colour of washing machines, this washer comes in black and has a smart, sleek design. However, it is not enough to choose a washing machine based solely on its looks. So, we decided to take a journey into the inner workings of this Ultima RPD946JKK washer to find out if it is as eco-friendly, energy efficient, and feature loaded as the rest of its fellow models in Hotpoint’s S-Line of washers. You can discover just what we found out below. 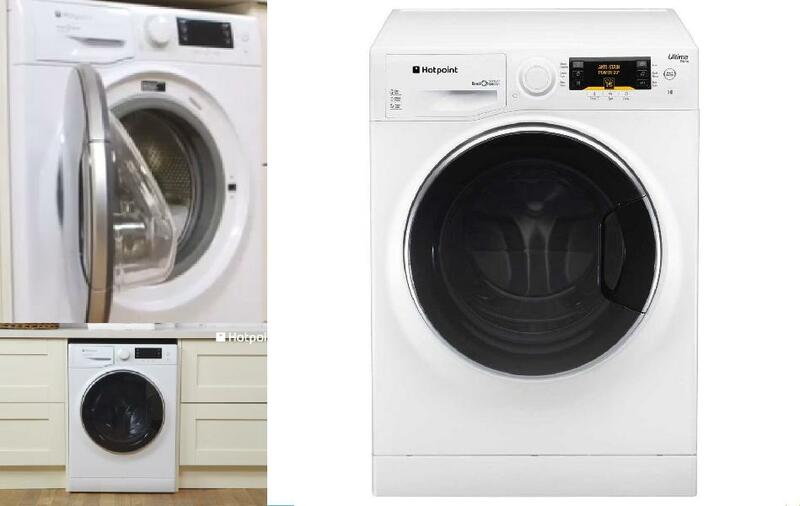 Much like its siblings, the Hotpoint Ultima S-Line RPD 9467 J & the Hotpoint Ultima S-Line RPD 10457 JKK, this washing machine features a neat control interface that sports a very familiar detergent drawer found on the top left side corner of most of Hotpoint’s washing machines. A knob for choosing wash cycles and an ON/OFF button sitting at the centre are also a common fixture on many Hotpoint washers. On the control interface’s right side corner is where you will find all the action. A Direct Injection button (helps with maximum stain removal) and a START/PAUSE button sit neatly on the side, while 9 buttons surround an orange display. Each button is clearly labeled with its respective function making it easy to master the machine. There is a Temperature & Spin button for configuring wash settings, Time Saver, Colour Care, Steam Hygiene, and Multi Rinse buttons for customizing a wash cycle. The remaining 3 controls include Time Delay, Key Lock, and Auto Clean (cleans the internal parts of the machine) buttons. Although the dark door of this appliance means that your little one will not have the joy of watching clothes spin around during a wash cycle (which my nephew seems to enjoy doing right now), it gives way to a sizeable 9kg drum. Capable of taking a hefty wash load of laundry (large items such as a medium king size duvet or an equivalent of 45 shirts), the drum on this unit is perfect for large families. At 1400rmp, the Hotpoint Ultima S-Line RPD9467JKK offers one of the fastest spin speeds. The best part is that you can adjust the spin speed to your preference with every wash. The Ultima RPD946JKK combines a whopping 16 cycles (3 specifics for whites, coloured, darks, Anti-Stain Turbo, Wool cycle for delicates, Anti-Allergy, among others). Its smart technology allows it tackle virtually anything you throw at it. Whether you have coffee, wine, grass, mud, or even blood stains on your clothes, this washing machine will get it all out down to the very last bit. This is all thanks to Hotpoint’s Direct Injection technology, which is famed for removing over 100 stains at just 20-degrees C. Through the Direct Injection system, the machine mixes water and detergent separately and then releases the already activated cleaning foam into the loaded drum. This helps boost cleaning power by up to 60%, resulting in a deeper clean at lower temperatures. Hydrothermal technology, in turn, keeps temperatures within the drum at the precise point needed to ensure your clothes retain their original colour and brightness, while steam technology freshens clothes by removing bacteria. Dubbed by Hotpoint as the premium washing machine in energy efficiency, the Ultima RPD9467JKK comes with one of the best energy ratings on the market. Not only does this washer feature a rating of A+++ but it also goes on to add an extra 30% energy saving potential. This translates to an annual energy consumption of only 153kwh – a number that is lower than that of the more affordable Hotpoint Aquarius WMAQF and Hotpoint WMXTF 742 K washers. There is no reason why the Hotpoint Ultima S-Line RPD94567JKK washing machine should not excel in meeting your washing demands – whatever they are. Its drum capacity is spacious enough to handle a week’s worth of clothing as well as take on large items comfortably. What’s more, between the many wash cycle options and direct injection button, the machine has everything needed to deliver effective cleaning regardless of the level of dirt or type of clothing being washed. And, as if these are not enough to make the Ultima RPD9467JKK a good buy, the washer is quite durable thanks to its odour and mould preventing antimicrobial door seal – a fact backed up by its free 10 year Parts & 1 year labour Warranty, which is given when you register your washer with the manufacturer within 28 days of purchase. Although much cheaper compared to high-end washing machines in the market, the Ultima S-Line RPD10477DD is one of Hotpoint’s higher priced models. And, rightly so since this appliance comes with everything you could possibly want in a washing machine – huge drum, superior stain removal capabilities, adequate spin speed, and technologies designed to protect your clothes from all outward damaging elements including allergens. There is even an eco setting for the environmentally conscious individual. Therefore, whether you have kids that leave clothes extremely dirty making laundry a nightmare, or want a washing machine that can handle big loads and clean effectively the Hotpoint Ultima S-Line RPD10477DD will fit well into your home. 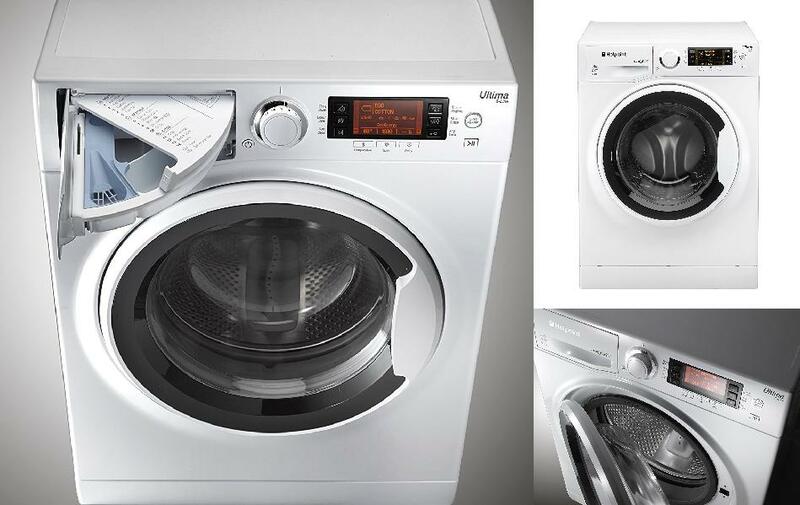 Despite featuring the usual white colour of washing machines, the RPD 10477DD is still stylish in design. Its front load door has a tinted finish that adds a touch of elegance to the overall look. The control interface is uncluttered and modern looking. It features an LED display, chunky cycle selection dial synonymous with Hotpoint models and a swing-out detergent drawer that cleverly hides a programme reference chart inside. The rest of the controls consists of a small battalion of press-to-select buttons namely; ON/OFF, Steam Hygiene, Colour Care, Auto Clean, Temperature, Spin, Time Delay, Key Lock, Multi Rinse, Eco, Direct Inject, and START/PAUSE. As is usual with Hotpoint washing machines, running a wash is simple. You just need to hit the ON/OFF button, turn the dial to your desired programme, tailor the wash cycle to suit the load using the relevant setting buttons, and hit START. This appliance features a 10kg drum that is befitting of a premium washing machine. Just 2 kilos shy of the typical maximum washing machine capacity, the drum is gigantic and will swallow as many as 50 shirts or loads as large as a king size duvet. Extending to a maximum of 1400rpm, the variable spin speed of this Hotpoint RPD10477DD washer is somewhat disappointing. Although quite fast and impressive at draining moisture from clothes, this spin speed is typical of much lower priced models. The wash cycles on this laundry machine number up to 16. A good amount but not something to brag about as you will find the same number in several of Hotpoint’s lower priced models. What puts the Hotpoint Ultima S-Line RPD10477DD a cut above the rest is a great combo of several special programmes that not only boost the machine’s washing performance but also increases the possibility of washes. First off is a Direct Injection function, which literally busts out 100 of the most stubborn everyday stains from the fibres of your clothes by pre-mixing water and detergent into a powerful cleaning foam that is then injected directly into a temperature and drum rotation controlled wash area. If you are washing baby clothes, towels, bedding items, or any other type of clothing that requires extra care, a Steam Cycle deepens the level of clean by pumping out steam for a while at the end of a wash. And, if you or a family member is prone to allergic attacks, there is an Anti-Allergy cycle is at hand to remove up to 99.9% of allergens. An Eco Rain Cycle specially designed for environmentally conscious people completes the list of this washer’s amazing cycles. With this cycle, a diverter sprays water onto clothes ensuring only very little water is used. If you thought the A+++ -30% energy rating of the Hotpoint RPD9467 JKK model was impressive, you will be blown away by what this Ultima RPD 10477DD washer has to offer. Running at 10% more efficiently than the RPD9467 JKK model, this washing machine comes with a fantastic A+++ -40% energy efficiency rating. Just another reward this washing machine offers as a way of giving you good value for your money. The machine is quite big and will, therefore, require a good amount of space. This is made worse by the washer’s enormous door, which opens at an angle that will make loading and unloading, a bit tricky in a cramped space. A bigger than average drum capacity, whisper quiet operation, super low running costs (around 141kwh annually), A rating washing performance, and a well thought out combination of wash programmes make the Hotpoint Ultima S-Line RPD10477DD worth every penny. The only downside you will have to contend with is an average spin speed and a high demand for space. Hotpoint is hard to beat when it comes to giving customers what they need in washing machines. The Hotpoint Ultima S-Line RPD 10457 JKK is just another one of the brand’s well-executed washing machines that has a lot to offer. Perfectly sized for a large family, this washer boasts a 10kg drum. It is fitted with smart technologies that know how to tackle stubborn stains and when to ease off for a gentler touch on your load of delicate linen. 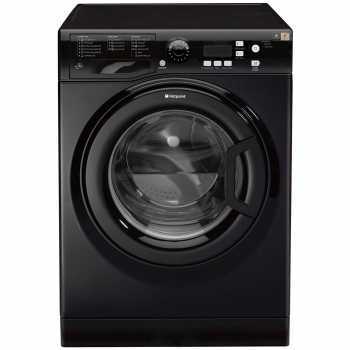 What’s more, the machine sports a stunning black sleek look, is easy to use and offers an assortment of wash cycles you will find very useful. Best of all, this washer will save you money on your overall energy bills. Get the full details of what to expect as we continue on in this buyers guide. In true Hotpoint fashion, the Ultima S-Line RPD 10457 JKK washing machine uses a combination of a soap drawer, cycle selection knob, and clearly labeled function buttons to make the process of doing your laundry feel less of a chore. Besides ON/OFF & START/PAUSE buttons for activating the machine’s selection of cycle options, you also have Colour Care, Temperature, Spin, Steam Hygiene, Multi Rinse, and Direct Inject buttons. An additional Key Lock button helps you protect the washer from the inquisitive nature of children, while an Auto Clean button gets the machine to clear its internal parts of gunk and other damage triggering substances. Lastly, Time Delay and Time Saver buttons allow you to schedule the machine to run at a specific time or cut down on the length of wash cycle respectively. The washer also features a well-detailed screen that keeps you well informed of everything that is going on during a wash cycle. A massive 10kg drum capacity is one of the impressive features this machine offers. With this much space, you will most likely be able to load in a huge chunk (if not all) of your normal laundry loads into the washer before you have to start cramming in clothes to get the machine to full capacity. The variable spin speed of this appliance is great and will do a more than decent job. The drum can spin at speeds of up to 1400rpm, giving this unit great water removal capabilities at the end of wash cycles. Since you can find higher priced models with the same spin speed, this is a plus for the S-Line RPD 10457 JKK washing machine. 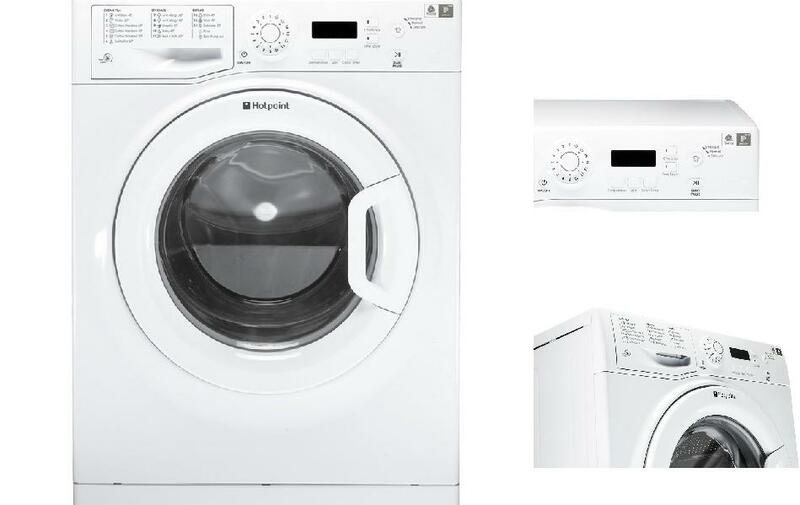 As befits a Hotpoint washing machine, the Ultima S-Line RPD 10457 JKK features a nice array of wash cycles that are designed with the user in mind. In total, there are 16 programmes, providing an option for every combination of laundry you will need to be clean. Hotpoint’s innovative stain-removal Direct Injection function is also available to help you deal with heavily soiled clothes. And, for a deeper intensive clean, you may opt for the Steam Hygiene Programme. Other wash options that come with this laundry machine include a Delicates cycle, a Colour Care Programme, and a certified Woolmark Platinum Care programme. Therefore, you will even have adequate functions for soft, light, or delicate loads of laundry. You even get an extra dose of hygiene in the form of an Anti-Allergy cycle that removes up to 99.9% of allergens that have lodged onto your clothing, not to mention a 20-minute Steam Refresh cycle (rids clothes of odours and smells), perfect for freshening up clothes that have been worn for only a short while. One feature that really sticks out is how quietly this washing machine runs. The washer combines an advanced brushless motor and sound insulating panels to bring noise levels to a stealthy 56dB when washing, and a respectable 76dB (far less noisy than a balloon popping, or even lawn mower) on a spin cycle. For a machine that packs 10kg loads, not being subjected to the almost violent drum rotations needed to handle a load of such magnitude is a blessing. Elsewhere, the RPD 10457 JKK is one of the best models as far as efficiency is concerned. Typical of Hotpoint’s Ultima S-Line washers, this RPD 10457 JKK model has EU’s highest official stamp of an A+++ energy rating, along with an extra 20% energy saving promise to boot. As with most washing machines, wash cycles are long with some taking as much as 3 hours. The shortest wash cycle you can do is about 40 minutes. Much like its almost identical model, the Hotpoint RPD94567JKK, this tall, dark, and slick Ultima S-Line RPD 10457 JKK washing machine is designed to deliver seamless efficiency when it comes to doing laundry. Its 10-kilo drum is one of the best sizes you can hope for while the plenty of handy wash programmes on offer will definitely not disappoint. 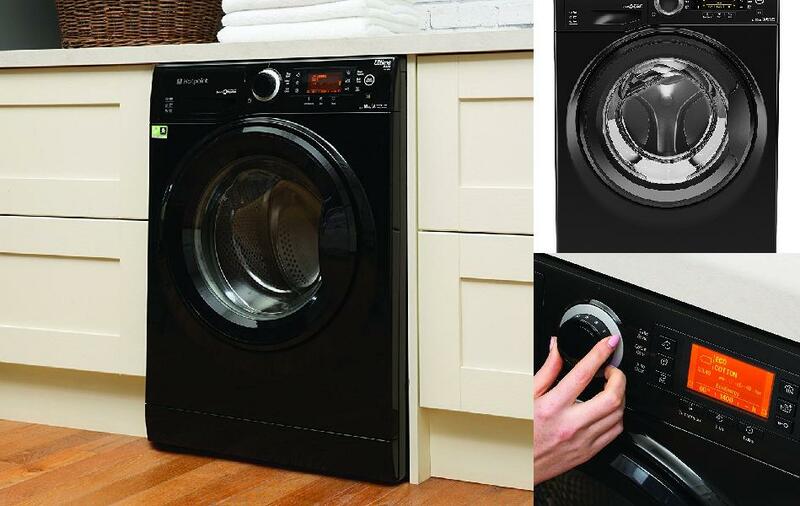 High-energy ratting, ultra-quiet design, and great looks go on to add to this washer’s highlight features, making it a great catch. 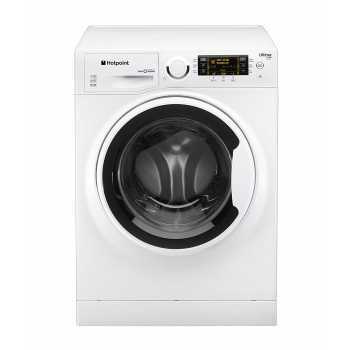 If you are looking for a no fuss, high-performance washing machine, the Hotpoint WMXTF 742K fits the bill perfectly. In addition to featuring what is arguably Hotpoint’s simplest user interface, this laundry washer offers a comprehensive list of wash options. Its special programmes offer plenty of benefits such as cutting down on wash time, removing 20 of the most stubborn stains, as well as leaving clothes feeling fresh and germ-free. 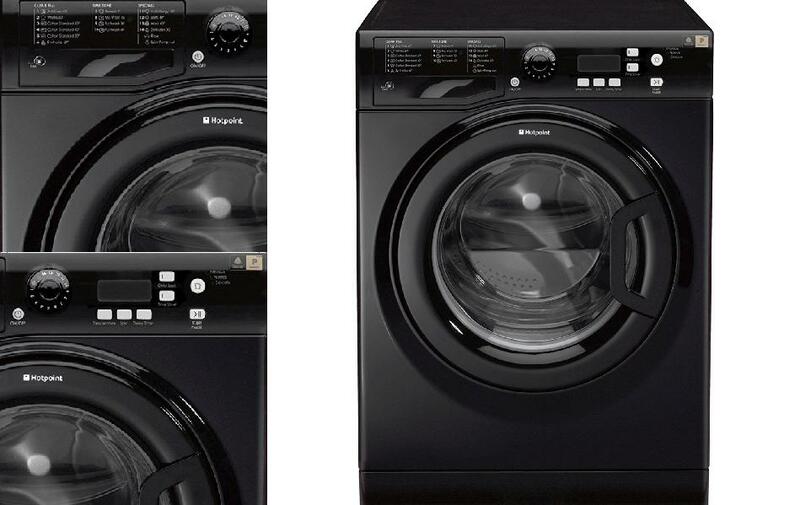 Read on to find out what the Hotpoint WMXTF 742K washer brings to the table. Much like one of the Aquarius range in affordability – the WMAQF 721P, this WMXTF 742K washing machine has a simple and straightforward control panel. 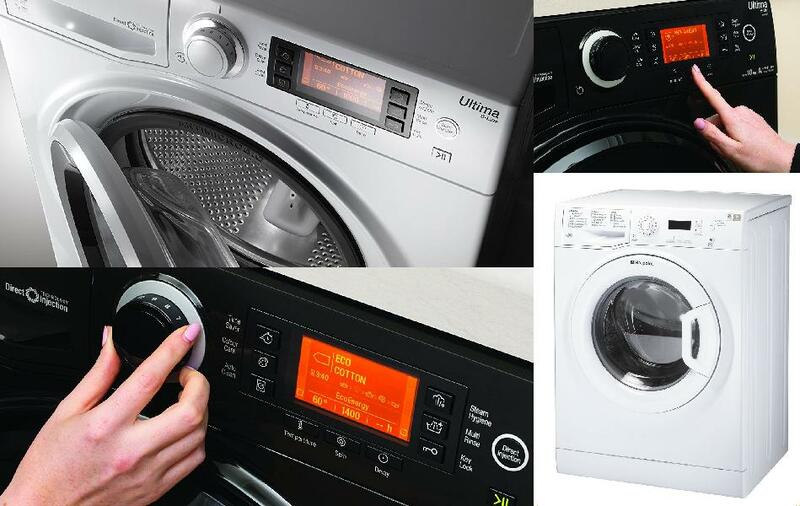 There is no complex interface to interact with or a myriad of buttons to consider – just the usual Wash Cycle Selector Knob found on most Hotpoint washers and a few other buttons (Temperature, Spin, Delay Timer, Child Lock, Time Saver, and Wash Intensity) for customization purposes. Each button has a corresponding label and symbol while the cycle knob sports numbers and a couple of symbols for the machine’s 16 programmes on the dial’s outer edge. A detergent drawer next to the knob lists the various programmes that each number and symbol represents. When choosing a cycle, you will need to bring the necessary number to rest on the uppermost part of the dial and a description of the selected cycle will show up on the washer’s screen. But, before anything else, you must turn the machine on with the available ON/OFF button. The rest is easy as you simply adjust temperature, spin, and wash intensity to your desired choice, hit the START/PAUSE button, and sit back with a cup of tea while you do your laundry. At 7kg, the drum on this Hotpoint washing machine is not the biggest around. However, unless you have a small army living in your home, this washer should do just fine. Generally, a 7kg washing machine drum can hold up to 35 shirts, so the Hotpoint WMXTF 742K washer can easily carter to a household of 3 to 4 or even 5 people. 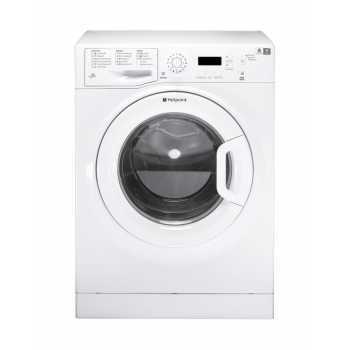 When it comes to spinning performance, this Hotpoint WMXFT 742K gets a B rating. The washer has a variable spin speed that goes all the way to 1400rpm. This is quite fast because the machine can remove up to 47% of water content in clothing after setting a load to wash at a 60-degrees C on maximum rotation speed. The Hotpoint WMXTF 742K may not have a monster capacity, slick user interface, or boast of fancy wash features, but it offers something that every busy household will enjoy – convenience. In fact, when it comes to convenience, nothing beats this appliance. From an Anti-Stain function that eliminates the need for pre-soaking heavily soiled clothes, to a Time Delay feature, which allows you to schedule a wash into a hectic day, this washer helps ensure your laundry gets done regardless of how busy your day might seem. The Time Zone cycle, in particular, is an amazing addition that can help solve an array of problems. For instance, if you spill coffee on your clothes or your baby throws up on you before work, you do not have to change your entire outfit. Simply toss the affected cloth in the washer, select the 9-minute garment refresh option on the Time Zone cycle, and you are good to go. You can also clean the entire outfit using the 15-minute outfit wash option. Alternatively, if you forgot to do the week’s laundry, or cannot seem to find the time to, the 30-minute half load & 60-minute full load options can come in handy when dirty clothes start piling up. You also get Hotpoint’s usual array of wash programs (numbering 16 in this case) that take care of everything including different kinds of cotton, synthetics, silks, and delicates. Even Hotpoint’s renowned Woolmark Platinum Care and Anti-Allergy cycles are included in the washer’s long list of wash cycles. 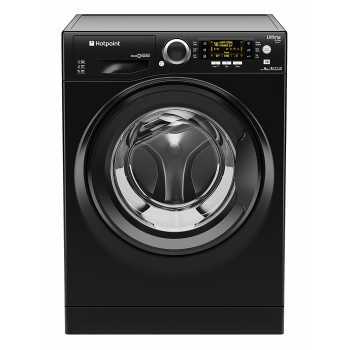 Thanks to the combination of a not-so-big drum, a modest number of wash programmes, and selectable fast wash cycles, this Hotpoint WMXTF 742K does not cost much to run. It has an energy rating of A++ and is estimated to consume 192kwh/year. Does not have Hotpoint’s stain busting Direct Injection function. However, an Anti-Stain cycle makes up for this shortcoming. With a price tag that falls well below the £350 threshold of affordable washing machines (at the time or writing), the Hotpoint WMXTF 742K is a rare find. Its dark and sleek design will look great in your home while its lengthy list of wash options ensure there is a solution to all your laundry woes. Its low running costs and solid spin performance seal the deal in making this appliance one of the best low-cost units on the market. It is easy to confuse the Hotpoint Ultima S-Line RPD 9467 J UK/1 with the Hotpoint Ultima S-Line RPD 9467JKK – after all, both have an almost similar name. And, not just that; a closer look reveals that these washers even have several identical features including the same dimensions, modern sleek design, extensive parts warranty, as well as Hotpoint’s Super Silent, Direct Injection, and Steam Hygiene technologies. So, if you are having trouble choosing between the two models, a good way to break the deadlock would be to find out what differentiates the two; and we’ll cover just that in this buyers guide on the Hotpoint Ultima S-Line RPD 9467 J UK/1 washer. The controls of the Hotpoint Ultima S-Line RPD 9467 J/1 feature the exact same minimalist design found on the RPD 9467JKK model. A detergent dispenser drawer on one side, 11 buttons (Direct Injection, START/PAUSE, Time Saver, Color Care, Steam Hygiene, Multi-Rinse, Time Delay, Auto Clean, Temperature, Spin, and Key Lock) on the other end, and ON/OFF button right next to a rotary dial in the middle of the control panel. Also featured is an LCD display that shows chosen settings in orange. The rotary dial allows you to choose the wash cycles. It is labelled with numbers all around it, thus ensuring easy operation. Once you select a cycle, it will be listed (number & cycle) on a clever swing-out cover found inside the detergent drawer. The rest of the buttons are for customizing a wash cycle except for the key lock and auto clean buttons whose respective functions are locking the control panel and triggering an internal cleaning of the machine. The ON/OFF and START/PAUSE buttons function as labelled. You may need to keep referring to the cycle guide cover, but other than that, the machine is quite easy to master. Much like its counterpart the Ultima S-Line RPD 9467JKK, this washing machine features a 9kg drum capable of handling regular-sized loads as well as large laundry items. This appliance, however, adds an extra kick in the form of Smart Technology, which weighs the current load and then automatically adjusts the water level, wash runtime, and energy, to ensure the most efficient cycle. As a result, the washer costs less to run than other models with a 9kg drum. The Hotpoint Ultima S-Line RPD 9467 J UK/1 washer offers a generous maximum spin speed of 1400rpm. Spinning action is adjustable using the included spin button. Another thing to love about this washer is that it remains fairly quiet during spin cycles despite the high 1400-rpm speed, earning the washer a solid B rating in spinning performance. When it comes to washing options, the Ultima RPD9467 J/1 has it all – 16 programs to be precise. The inclusion of a Colour Care cycle means you can wash everything from precious whites to dark coloured clothes, and even colour running jeans while preserving colour intensity. A Daily Wash 30°C cycle offers the perfect setting for everyday normally soiled loads. And, for those awkward or high demanding laundry items, this appliance has several special programs on offer. These include Woolmark Platinum Care, Steam Refresh, Anti-Allergy Plus, Anti-Allergy Delicates, Super Injection for super soiled loads, and Anti-Turbo Stain Cycle designed to clean averagely soiled clothes in a quick 45-minute period at 20°C. There is even a dedicated Duvet Cycle for both single and double duvets as well as a Bed and Bath cycle for towels and other bed linen. Overall, this Hotpoint machine cleans deep while leaving your clothes looking amazing, smelling great, feeling fresh, and healthier than they were prior the wash. This washing machine features an antimicrobial seal around the door. The seal prevents bacterial proliferation by up to 99.99%. This coupled with the Auto Clean function helps enhance the durability of the appliance. Hotpoint’s Ultima S-Line RPD 9467 J UK/1 washing machine also boasts a very high-efficiency rating, which is 20% better than EU’s maximum energy rating of A+++. Only a few models such as the Ultima S-Line RPD9467JKK & RPD10477DD have an energy rating that surpasses this one. The combination of auto clean function, smart load technology, and antimicrobial seal means it will be hard for the machine to break down before living out its lifespan. It is hard to fault except maybe that regular wash settings take long to complete. However, the Time Save option counters this downfall by reducing the wash time. Perfect for large families, the Hotpoint Ultima S-Line RPD 9467 J UK/1 is a great looking, energy efficient, and feature packed machine that is built to cope with whatever demands are placed on it. Its counterpart, the Ultima S-Line RPD 9467JKK washing machine, delivers just as much. Therefore, choosing between the two basically comes down to price. In this respect, the Hotpoint Ultima S-Line RPD 9467 J UK/1 makes a better buy since it is cheaper by around £20 at the time of writing. At this point, you have might have an idea on the model of washing machine that will be suitable for your home. This brings out to the next part of this washing machine buyers guide – figuring out what features are the most important. Even though this guide focuses on Hotpoint these 5 essentials are what we recommend, at the very least, you should look for when buying any washing machine. Unlike what many people assume, the bulk cost of investing in a washing machine does not necessarily lie in the buying price. Given that the average home will wash a load of clothes at least 3 times a week, having a washing machine will also cost you in utility bills. And, if the washing machine you buy is not designed to run efficiently the cost of running it can easily add up and surpass the initial investment. This is why energy rating is the most important feature to consider in a washing machine. Energy rating is an official EU label that gives a rough estimate of a washing machine’s energy efficiency. The rating is basically arrived upon after calculating how many hours a washing machine will use annually to run full and partial 60-degree Celsius cotton loads and a 40-degree Celsius partial cotton load. Much like a test score, this rating is given in the form of a single letter. In the past, this rating extended from ‘A’ up to ‘D’ with the latter considered the lowest rating. However, as of 2014 the rating system changed and washing machines started being rated as A+++, A++, A+, and A in order of most to least efficient. In the UK, drum (also sometimes referred to as a tub) sizes for washing machines range from 5kg to 12kg. The weight measurement represents the number of kilos of dry clothes the drum can hold. Normally, the larger the drum size, the better the washing machine will be at handling mountains of laundry in one go. However, big is not necessarily the best way to go for everyone. What you need to do instead is find a washing machine whose drum will be able to keep up with your usual load of clothes. It is also important to look into the interior dimensions since a drum can be big but feature an agitator or an unorthodox design that eats up space. The material of the drum also matters. In general, stainless steel drums are the most durable followed by plastic ones. Other materials options tend to feature durability issues. For example, a porcelain-enamel washing machine drum can chip and rust. Although many washing machines do not double up as a dryer, a spin cycle is a setting put in place to remove water from clothes at the end of a wash. The higher the spin speed, the more water your washing machine can draw out, which means the less time the clothes will require to dry whether air-dried on a clothing line or tossed into a dryer. So, fast spin speeds should be high on the list of priorities for your washing machine. That said, you should know that high spin speeds usually come at the expense of a machine being noisier and more costly. Washing machine manufacturers measure spin cycles in revolutions per minute (rpm), with options usually ranging from 1000rmp to 1800rmp. You can also find models with a spin cycle of just 800rmp. Spin speeds of between 1200 and 1400 rpm are considered good enough since delicate fabrics can be sufficiently wrung at a mere spin speed of 500rpm while a spin cycle of 1000rpm will be adequate for something heavier like a pair of jeans. For ultimate convenience, buy a machine with variable spin cycles for different loads of clothes. The washing machine you buy must be able to handle everything you throw at it, and multiple wash settings help to make this possible. The more flexible the settings, the better the machine will be at meeting your needs. For instance, a washing machine that not only includes the usual settings (cotton, wool, delicates, mixed fabric, and synthetics), but also features a bleach dispenser, allows you to adjust water levels & detergent quantity, or adds a sports cycle, fast wash option, or setting for baby clothes would be a good buy. Unless you are an expert mechanic, it pays to have a warranty for your washing machine. Most washing machine manufacturers offer a standard parts-and-labour warranty that can be good for 1 or 2 years. A good number of manufacturers also offer the possibility of extending the warranty to anywhere between 2 to 5 or more years. Keep in mind though that an extended warranty might cost you more. It goes without saying that the terms and conditions of warranties vary significantly, so make sure to look into the fine print before being carried away by a lengthy warranty. This buyers guide would be incomplete without discussing how much washing machines typically cost. Since washing machines come in different types and with a wide array of features, prices tend to vary greatly. Generally, freestanding, front load and automatic washers are more costly than their respective integrated, top load, and semi-automatic counterparts. Also, a washing machine with built-in dryer will cost more than one without. On the plus side, the vast price range means you are guaranteed to find one within your budget. For instance, decent entry-level washing machines fall in the very affordable price range of £200 to £350. However, you should be very careful when shopping for a cheap washing machine. A good number tend to consume lots of energy, others may require a lot of water to operate, while some do not even do a good job of washing your clothes. To be on the safe side, stick to reputable brands such as the focus of this guide: Hotpoint. Because they have a proven track record of creating affordable and reliable devices. For mid-tier washing machines, prices usually range from £400 to £700. These usually offer more flexibility with their spin cycles, bigger drums, quieter operation, and more features than entry-level models. 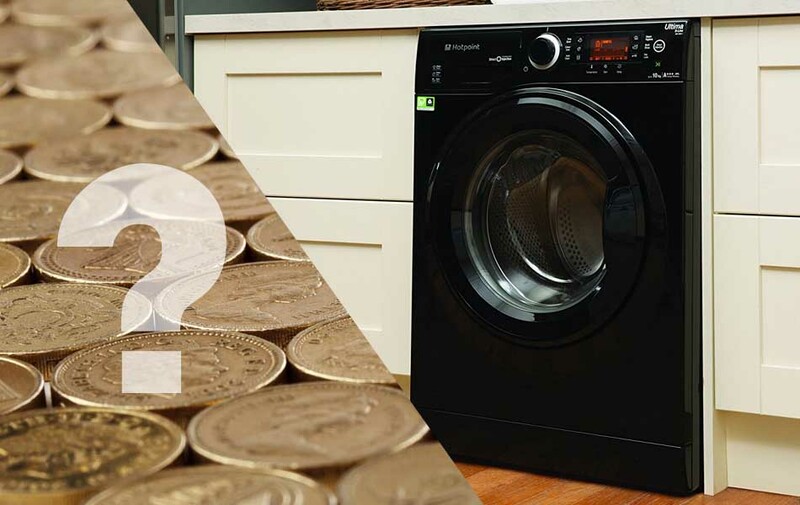 On the high end, washing machines can cost anywhere from £900 to well over £1000. Of course, expensive washing machines come with the very best of washing machine technology – powerful drives, internal heaters, faster than average washing speeds, steam cycles, etc. Although this extra technology is often not worth, or noticeable in is ability to clean, for most households. One last thing to remember when shopping for a washing machine is that you will need to measure up your space beforehand. For this, you simply need to measure the width and height of the space where the machine will go in cm, and then shop accordingly. Make sure to also to factor in clearance space all around the washing machine when taking your measurements. This is highly important as it will make it easy to; open the washer’s door, move around effortlessly with a basket of laundry (dry or wet), gain access to water hose or electric connections of the machine, and open and close any doors leading to the laundry space without banging into the machine. While there are plenty of high-end washing machines in sleek colourful designs and all manner of cool features, we believe this roundup of Hotpoint washing machines provides the core essentials will for cleaning your laundry. And, the best part is the most basic washing machine will only cost you around £250. This leaves you with plenty of room to up your budget and add onto the list of features by going for a machine that has temperature control, pre-soak cycle, laundry load auto-adjust, touchpad controls, and so on without breaking the bank (should you want a bit more bang for your buck). If you’re a little unsure quite what machine might be right for you we recommend taking another look at the comparison table. You’ll be able to view and compare the different models we have selected and find out more information such as the current price and features available.